Image credit: Copyright © F. Blanco. Used in accordance with federal copyright (fair use doctrine) law. Usage by ICR does not imply endorsement of copyright holder. Figure 1. An illustration of a helium atom moving through a crystal lattice. Image (a) shows a helium atom’s initial position within a crystal lattice (position A). Energy is added to the helium atom by collision with atoms making up the crystal lattice, the addition of phonons or heat to the crystal, or the addition of electromagnetic radiation. 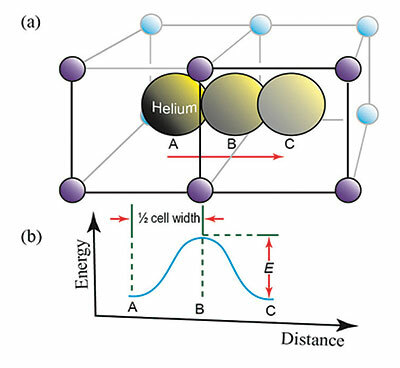 If enough energy is added (activation energy, E), then the helium atom is bumped toward the next unoccupied lattice site (B). It comes to rest at another lattice site (C) when its energy drops below the activation energy, E. This continues until the energy supply is exhausted or the helium atom leaves the crystal. Figure 2. Typical plot for the diffusion coefficient in a natural mineral. It is generally known as an Arrhenius plot. Note the x-axis or abscissa has an inverse temperature scale so that the higher temperatures are to the left and the lower temperatures are to the right. where D1 and E1 are the modified diffusion constant and activation energy for a damaged crystal. The defect parameters D1 and E1 are almost always smaller than the intrinsic parameters D0 and E0. Due to this feature of diffusion, the slope of the defect line is almost always shallower than the slope of the intrinsic line. Figure 2 is a graphical representation of a typical diffusion curve.2 Because defects are very common in naturally occurring crystals, especially crystals containing radioisotopes, the two-slope curve seen in Figure 2 is typical. In the 1970s, geoscientists from Los Alamos National Laboratory drilled core samples at the Fenton Hill site in the Jemez Mountains of New Mexico. In borehole GT-2 they sampled the granitic Precambrian basement rock. This rock was assigned a radioisotope age of 1.5 ± 0.02 billion years as determined by various secular dating methods using U, Th, and lead (Pb) isotopes. The depth of the samples varied from near the surface to 4.3 kilometers in depth, with in situ temperatures ranging from 20°C to 313°C respectively. The Los Alamos team sent some of the core samples to Oak Ridge National Laboratory for isotopic analysis. Robert Gentry, an Oak Ridge physicist, analyzed zircons extracted from these samples for total helium content by heating them to 1000°C in a mass spectrometer in which the amount of 4He liberated was measured. 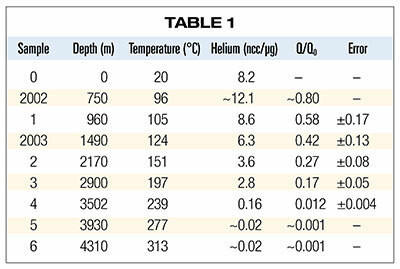 Table 1 summarizes the results of his measurements plus two additional samples (designated as 2002 and 2003) analyzed by Dr. Humphreys and colleagues as part of the RATE project.5 Column 1 is the sample designation, and columns 2 and 3 list the in situ depth and temperature for each sample respectively. Column 4 lists the volume of helium liberated (at standard temperature and pressure) in the laboratory per microgram of zircon (1 ncc ≡ 10-9 cm3). Column 5 is the ratio of the observed quantity of helium in the crystal (Q) to the calculated quantity of helium that would have accumulated and been retained in the crystal (Q0) had there been no diffusion of helium out of the crystal. Uncertainties in calculating Q0 dominate the estimated errors listed in column 6. 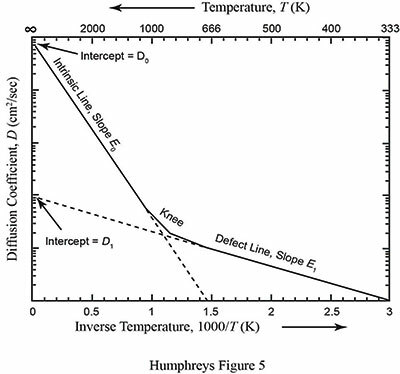 According to the dependence of diffusion on temperature outlined in earlier paragraphs, we would expect to observe that the hotter sample 6 would have much less helium than sample 5. The fact that the helium content didn’t decrease suggests that some additional effect may have come into play above 277°C. So, sample 6 wasn’t included in the analysis of samples 1 through 5 by the RATE researchers. Figure 3. Diffusion coefficients observed in zircons from the Ural Mountains in Russia, the Jimenez granodiorite, and the Fish Canyon Tuff in Nevada. The “knee” in the data from the Ural Mountains is due to extreme radiation damage in those zircon crystals. Figure 4. Early diffusion data from GT-2 borehole zircon samples (blue dots) compared with the creation model predictions (green squares) and the uniformitarian model predictions (red squares). The RATE team was then faced with developing two models for the migration of helium out of the zircon and into the surrounding biotite. One model was based on a creationist view of history and the other was based on the billion-year uniformitarian view.11 Figure 4 compares the data with the model predictions. Clearly there is a considerable and irreconcilable difference between the two models. 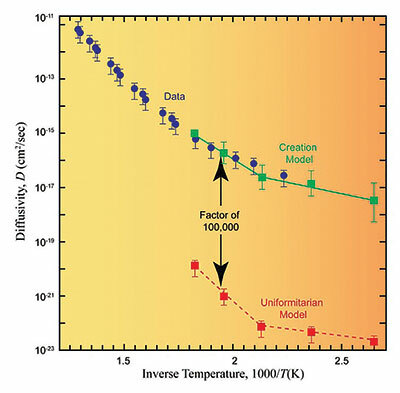 The creationist model agrees remarkably well with the actual data; the uniformitarian model predicts diffusivities more than 100,000 times lower than the actual data show. The data predict that within the uniformitarian model all zircon samples would retain much less helium than is observed. Rearranging the diffusion equation for the creation model, one obtains an approximate age for the GT-2 borehole rock of 5,680 ± 2,000 years—as compared to the assumed 1.5 billion-year age in the uniformitarian model. The RATE team concluded that although approximately 1.5 billion years of U/Th decay at today’s decay rates occurred within the GT-2 borehole rock, helium generated by that decay had only been escaping for about 5,700 years, which is why large amounts of helium were still present in the zircons. This discrepancy can be resolved if there was a time in the past in which nuclear decay rates were much higher. This is strong observational evidence that at some time in the past, accelerated nuclear decay did occur. RATE zircon/helium measurements showing only thousands of years provide powerful evidence for recent creation. Obviously these findings set the secular science community into a frenzy, so much so that all types of objections to the experimental data and its interpretation have arisen. These questions and objections have been more than adequately answered by the authors of this investigation.12,13 Ultimately it comes down to which version of history one believes: Do you prefer the naturalistic view of history or the extremely clear biblical narrative? 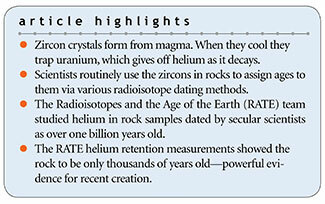 The RATE zircon/helium measurements showing only thousands of years provide powerful evidence for recent creation. Humphreys, D. R. 2005. Young Helium Diffusion Age of Zircons Supports Accelerated Nuclear Decay. In Radioisotopes and the Age of the Earth: Results of a Young-Earth Creationist Research Initiative. L. Vardiman, A. A. Snelling, and E. F. Chaffin, eds. El Cajon, CA: Institute for Creation Research and St. Joseph, MO: Creation Research Society, 32. The RATE project was a research project conducted by the Institute for Creation Research and the Creation Research Society to assess the validity of radiometric dating and other dating techniques in the light of the doctrine of a recent creation. The project’s findings were published in 2005. Geologists use three general classifications for rocks: igneous, metamorphic, and sedimentary. 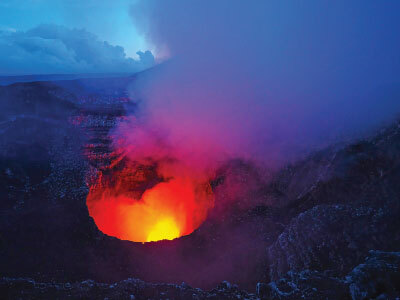 Igneous rocks are the result of magma cooling and hardening. Examples include basalt and obsidian. Sedimentary rocks are formed from particles of sand, shells, pebbles, and other fragmented material. It is usually the only rock type that contains fossils. Limestone, shale, coal, chalk, breccia, and paragneiss are examples. Metamorphic rocks are formed by intense heat and pressure under the surface of the earth from other types of rock. Marble, gneiss, quartzite, and slate are metamorphic rock. Humphreys, Young Helium Diffusion Age of Zircons, 29. Magomedov, Sh. A. 1970. Migration of radiogenic products in zircon. Geokhimiya. (2): 263-267 (in Russian). English abstract in Geochemistry International, 7 (1): 203. Reiners, P. W., K. A. Farley, and H. J. Hickes. 2002. 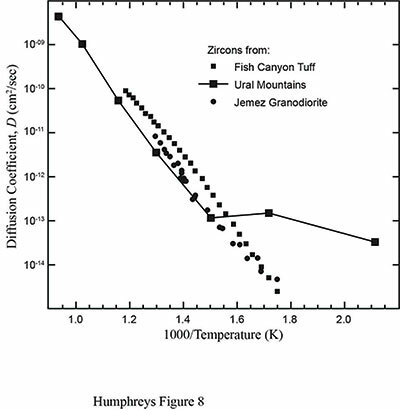 He diffusion and (U–Th)/He thermochronometry of zircon: initial results from Fish Canyon Tuff and Gold Butte. Tectonophysics. 349 (1-4): 297-308. Humphreys, Young Helium Diffusion Age of Zircons, 40. Results of those measurements can be found on page 45 of the above reference. Humphreys, Young Helium Diffusion Age of Zircons, 55. Humphreys, D. R. et al. 2004. Helium Diffusion Age of 6,000 Years Supports Accelerated Nuclear Decay. Creation Research Society Quarterly. 41 (1): 1-15. Cite this article: Vernon R. Cupps, Ph.D. 2019. Helium Retention in Zircons Demonstrates a Young Earth. Acts & Facts. 48 (1).